The first food we started our ecowarrior on was not rice cereal–which as our doctor (and others have) noted is a refined grain and a good way to start a baby down an unhealthy dietary path. Instead, our doctor recommended the healthy and wholesome sweet potato. It’s simple to make: just rinse the skin of 4 or 5 sweet potatoes and bake with skin on in an oven at 400 degrees for about an hour (basically until it’s soft). Then once they cool, peel off the skin and mash them in a bowl. You can add some olive oil or once the baby is eating dairy some butter if you prefer. Then throw some of the mash into ice cube trays and freeze these and you’ll have enough sweet potatoes frozen for several weeks (mixed in with other foods). 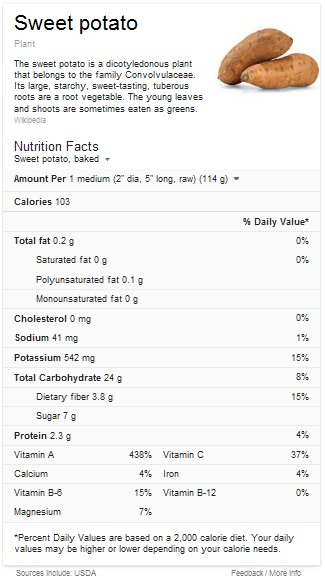 If you like more directions in your recipes, here is a fuller description of the process of baking sweet potatoes, and even a video.